The Plan envisages the positioning of Kenya’s domestic capital markets as the premier choice for investors and issuers through robust regulation, supportive innovation and enhanced investor protection. This international high standard will be achieved through the adoption of dynamic and evolving capital markets regulation, proactive development practices and outcome-based actions designed to ensure that the Kenyan market will be positioned to compete with the best globally. The first Strategic Plan of the Authority (2002 -2005) was developed and launched in 2002 with a seven-prong reform agenda; In November 2006, the Authority reviewed the Capital Markets Strategic Plan: 2006-2010 representing comprehensive plans of action aimed at strategic positioning, broadening and deepening the capital markets and making Kenya a leading financial center in the region. The Strategic Plan was developed in line with the tenets of Kenya Vision 2030. The 2009 -2013 outlined a nine-prong reform agenda, highlights of some main milestones realized and a sequence of the reform measures and action plan for the plan period. Establishment of robust, facilitative, legal and regulatory framework that conforms to international best practice. Strengthening the professional and corporate image of the Authority. 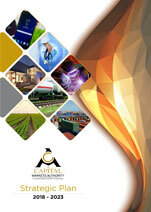 Enhance capital market infrastructure and institutional arrangement. Promote investor education and public awareness.